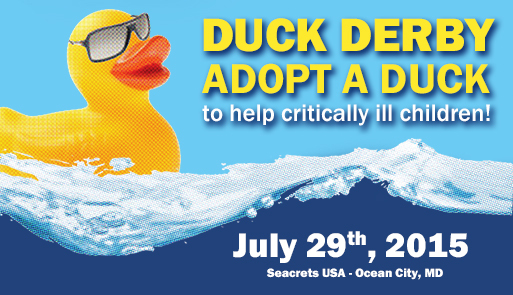 Join us for our annual Duck Derby on July 29th at Seacrets in Ocean City, MD! Anyone wishing to adopt a duck can do so by calling us at 1-800-933-5470. Rain or shine, your ducks will compete on July 29th. All proceeds go toward supporting our mission of helping critically ill children and their families to believe in tomorrow! Still not sure what makes this event so fun? Check out this video from last year’s race!